Loctite 18637 SF 7452 Accelerator, Light Amber by Loctite at In The National Interest. MPN: 18637. Hurry! Limited time offer. Offer valid only while supplies last. 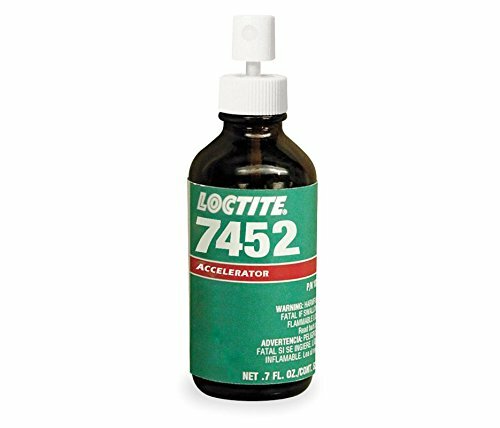 Loctite sf 7452 is used where increased cure speed of Loctite cyanoacrylate adhesives is required. It can be either Pre- or post-applied to the bond. Loctite sf 7452 is used where increased cure speed of Loctite cyanoacrylate adhesives is required. It can be either Pre- or post-applied to the bond. The product is especially suited for post-application on cyanoacrylate adhesive to ensure rapid fixturing. Typical applications include securing wires or coils to PCBs, tamper-proofing adjustable components, mounting Stand-Offs, edge guides and board stiffeners.